We gather round That Apple Tree to hear its story. Isaac Newton, as every English school child knows, was sitting in the garden when an apple from the tree under which he was sitting dropped beside him. He thought about it. And then he thought some more. Why do objects always fall vertically? Why not go sideways? Or upwards? Me, I’ve never even wondered about this. It’s just the way things are. But sitting under that apple tree, 350 years ago, Isaac Newton began to work on developing his best-known achievement: the theory of gravity. 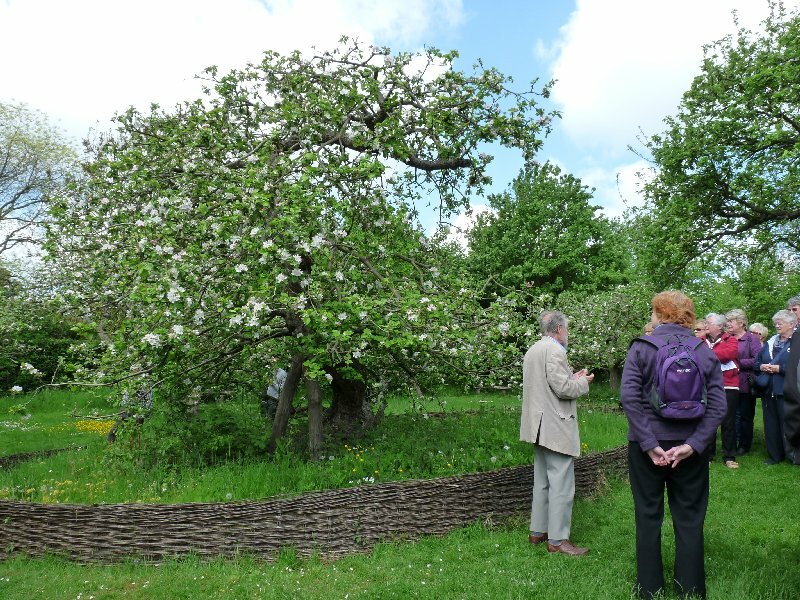 Yesterday, we visited the house where Isaac Newton used to live, and saw the apple tree which grew from the ruined trunk of the tree which he sat under. I’m a National Trust volunteer at Fountains Abbey and Studley Royal – more of that in my next post – and we were on a summer ‘works outing’, visiting a couple of properties in Lincolnshire. And here we were at Woolsthorpe Manor. It’s the farmhouse where Newton was born in 1642, and where he grew up. Isaac was a reflective, head-in-the-clouds sort of child, and it was obvious that he’d never be a useful farmer. His teacher persuaded his mother to let him study at Cambridge University, where he paid his way for some of the time by working as a valet. But in 1665, Cambridge temporarily closed its doors, for fear of the plague. It was during this time of ‘exile’ that Newton began many of his experiments in the field of optics, astronomy and the laws of motion. He developed the branch of mathematics we know as calculus. And then he left for Cambridge once more, and his career as academic, MP, and warden at the Royal Mint was launched. Woolsthorpe Manor , as Newton seems to have discovered, is the place to come to be reflective. 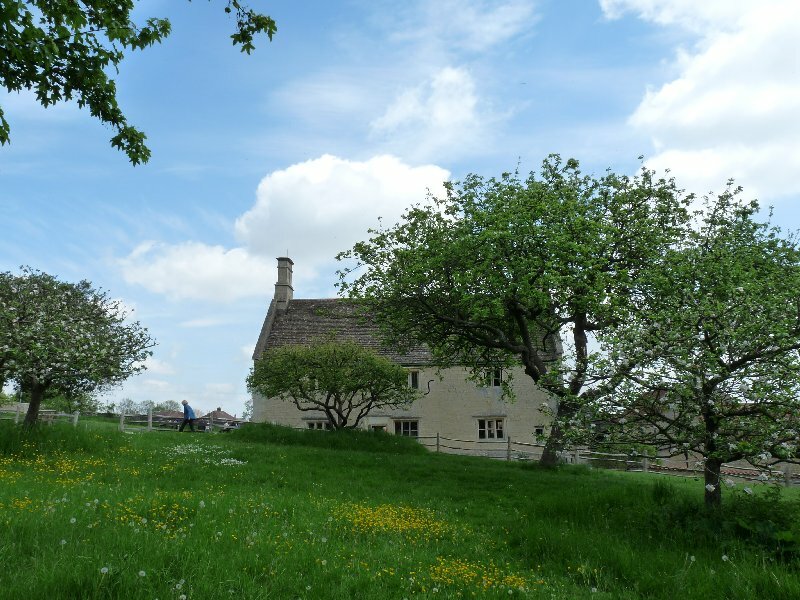 This is a seventeenth century yeoman farmer’s house, comfortable, unostentatious, and set among a jumble of outbuildings and an apple orchard where that famous tree still stands. In truth, it’s not quite the same apple tree. That was struck by lightning in its old age. But a shoot grew from its ruined trunk, and that’s the specimen we see today, propped, pruned, and generally cossetted to keep it going as long as possible. Other fragments have grown into other trees, as far away as a university in America. The orchard is filled with other ‘babies’ born of the original, against the day that almost-Newton’s-tree finally gives up. The orchard and grass are tended, but not too much, and sitting amongst the apple blossom, with the buttercups and meadow flowers moving gently in the breeze was a fine way to pass the late morning. There’s the house to see too. A working kitchen, a living area focussed round an enormous hearth, bedrooms – this was a comfortable family home. Then there’s the Science Discovery centre. Enjoy the chance to play with prisms, to break light up into all the colours of the rainbow before uniting them to white. Experiment with gravity, throwing weighted balls from the top of a tower… and so on. Get in touch with your inner child and learn a lot whilst you’re having fun. 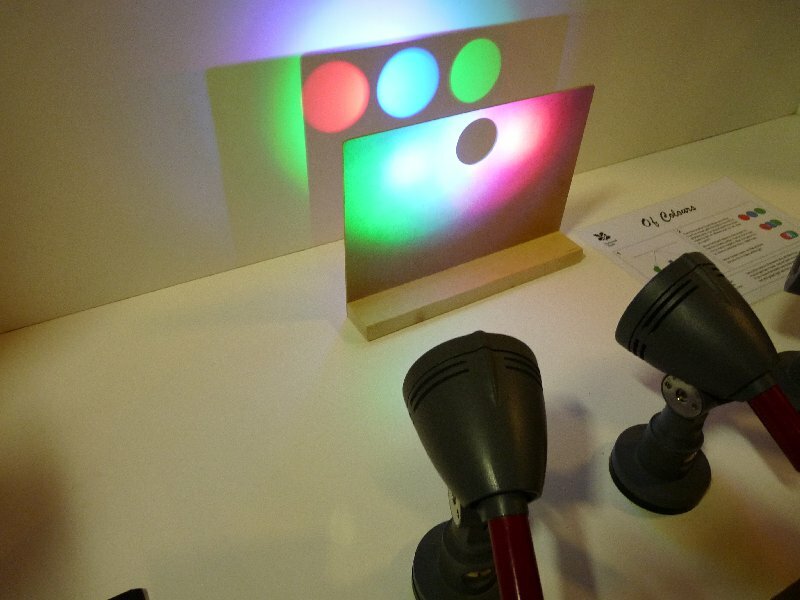 Playing with light in the Science Discovery Centre. And then go to the coffee shop there, treat yourself to a home-made cake and a nice cup of tea, and sit quietly in the courtyard there, reflecting on your good fortune at being in such a charming, relaxing, yet instructive place. Fascinating, great photos too and a rather interesting interior as well. A privy for two? Was that a normal arrangement – sounds almost like an ancient Roman affair! I don’t know the answer to that one. I noticed it rather late in the day and never got to ask anyone. This looks like the perfect way to spend a day–and I love the idea that that is the VERY tree (almost) Newtown sat beneath! Having this sort of connection with a person who has become sort of mythic reminds us that he was just a person, and that regular people can change the world. Pretty wonderful! Yes, and he thought of questions I never even consider asking. That’s genius! Oh do go. It’s a special place: quite charming and lovely, and peaceful too. It looks lovely and I agree I would never have pondered why things fall down. I wish I had a brain that worked more that way. Your brain encourages you to cook delicious food. Job done. How interesting – we are covering his three laws in physics. Read the kids a story from a picture book to kick off the unit and it mentioned he never married and ended up running the Royal Mint in addition to his scientific studies. Very bright and inquisitive man. Yes. The whole Royal Mint story in connection with Isaac Newton is an interesting one. Thomas Levenson’s ‘Newton and the Counterfeiter’ is a fascinating biography that focuses on that part of his life. Highly recommended. What a great tour of Newton’s home – would love to visit one day. It must be so interesting to get the full story on some of these historic places. It’s so very English. Well worth a trip. Previous Previous post: Bellflask: out in the wilds of just-round-the-corner.